As we keep saying -- in our Welcoming Kitchen -- winter means comfort food. 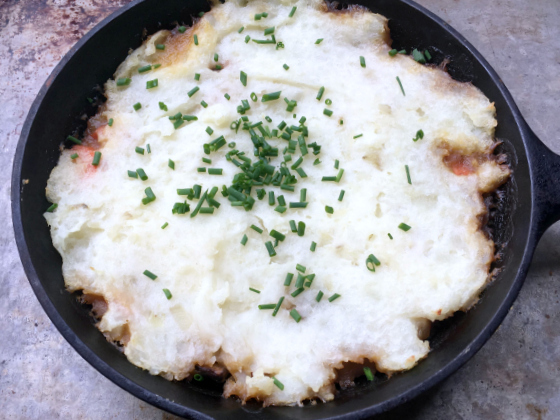 What could be more comforting than a hearty casserole topped with mashed potatoes? 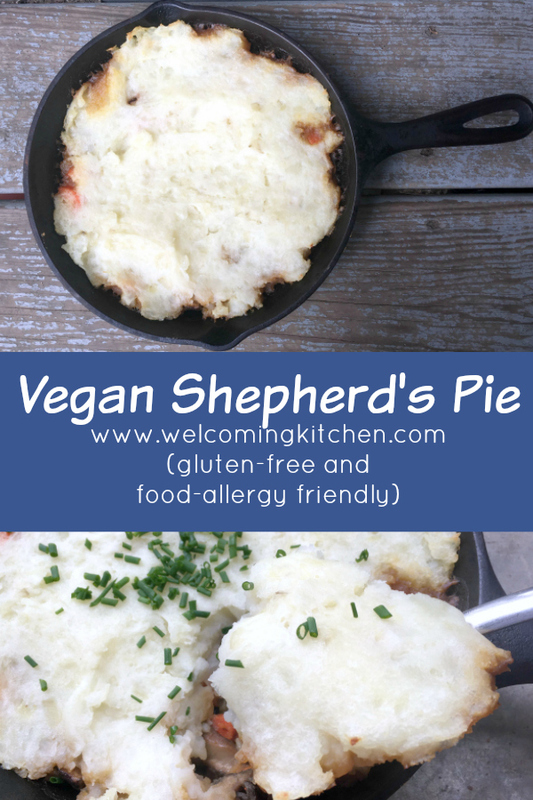 This shepherd's pie is a little different (and we think a lot better) than your average shepherd's pie that traditionally relies on ground meat -- or soy/wheat veggie burger -- because this one is gluten-free, soy-free, dairy-free and vegan. The combination of kasha and garbanzo beans contributes to a filling, protein-rich base that is good for everyone to enjoy. How's that for comforting! 2) In a small saucepan, combine kasha, boullion and 2 cups water. 3) Bring to a boil, then cover and reduce heat to a simmer. 4) Simmer 10 minutes then remove from heat. Set aside. 5) Peel and cube potatoes. 6) In a medium saucepan, add potatoes and water to cover. 7) Bring to a boil, reduce heat to a simmer. 9) In a small bowl, combine flaxseed meal with one cup warm water. Set aside. 10) In a small skillet*, heat one teaspoon olive oil over medium flame. 11) Add onion and garlic, cook until fragrant and softened -- 2 to 3 minutes. 12) In a 2-quart casserole or baking dish, combine cooked kasha, onion and garlic, carrots, drained and rinsed garbanzo beans, and flaxseed slurry. 13) Press down on mixture with the back of a spoon or your hand. Set aside. 14) When potatoes are fork-tender (easily pierced with a fork), drain them and place them in a large bowl. 15) Add non-dairy milk, remaining olive oil and salt. 16) Mash with a potato masher or fork. 17) Spread mashed potatoes over kasha mixture. 18) Bake for 30-40 minutes, or until potatoes are lightly golden. *Sometimes I use my large cast iron skillet at step 10, following the same instructions. I just bake everything together in the skillet.